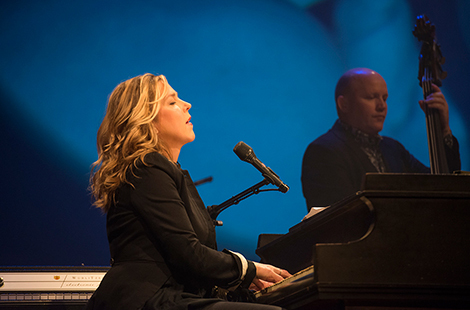 Grammy Award-winning jazz pianist and vocalist Diana Krall performed to a sold-out crowd at CSUN’s Valley Performing Arts Center on April 4. Read more about the show. CSUN's Valley Trauma Center announced its name change to Strength United. The longtime community resource provides critical services to survivors of sexual and domestic abuse. Read more about Strength United. The public can get a jump on the next fashion trends when CSUN apparel design and merchandising students showcase their most stylish creations at the university’s annual spring fashion show on Saturday, April 26. Read more about the student runway show. Tues., April 22, 7 p.m.
Wed., April 30, 7 p.m.
Manuel Pastor is an expert in the economic, environmental and social conditions facing low-income communities. He will highlight California’s demographic shift and widening economic gap during a special presentation. G. Michael Phillips of Finance, Financial Planning & Insurance for a motivating and easy-to-understand discussion on creating a viable financial retirement plan. Join students and colleagues for a day of awareness, activities, giveaways, games and yoga! Associated Students is hosting Earth Fair from 10 a.m. to 3 p.m. on Bayramian Hall Lawn.